Hello Loves! For all my Houston readers, we are officially one week away from the rodeo cookoff which means oh so close to Rodeo Season ya’ll! A couple weeks ago, I shared a rodeo outfit idea without cowboy boots, and this week I’m going full cowgirl with a rodeo outfit with cowboy boots. 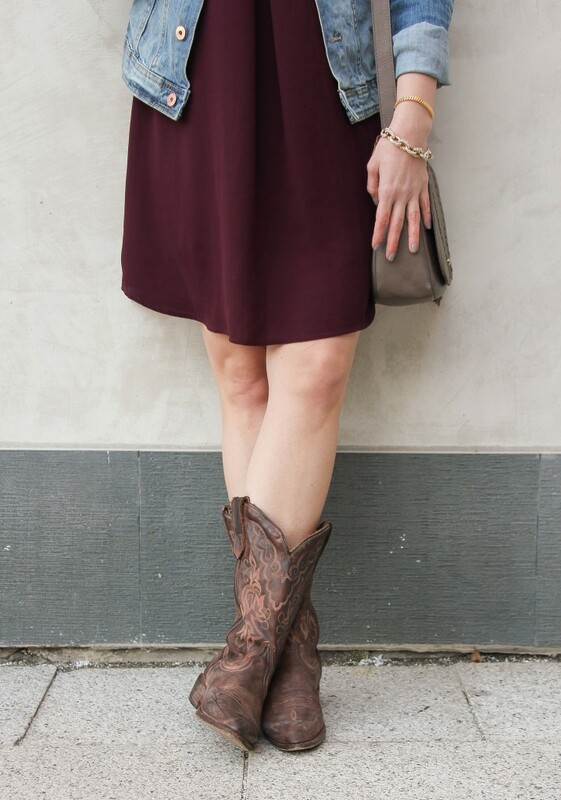 This western wear inspired outfit would work better for the last half of the rodeo when the weather warms up a bit. I finally added a denim skirt to my closet this year! I think the last one I owned was in college. 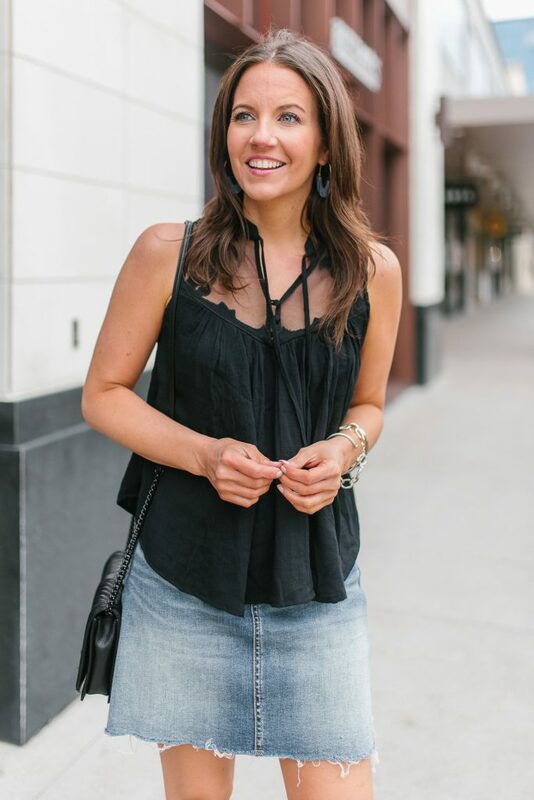 I have become such a skirt person, so a frayed hem denim skirt was something I wanted to add for the spring and summer. I love the natural faded look of this one and the length. It’s the perfect start to building the perfect rodeo outfit. I added on this western romance crop top to add a little boho and western flair to the look. My hair is covering the beautiful details on the shoulders of this top, oops! The sheer top portion also features a pretty floral design. I have another flowy crop top from this brand and wore it so much last summer. Even though, it’s not quite the weather yet, I knew I wanted to add this to my wardrobe stat! It will also be cute with skinny jeans and shorts. I pretty much only wear cowboy boots to the rodeo, so I only own this one pair which are a few years old. I found a few similar pairs to mine though in the links section. Mine are the Bed Stu brand, and I couldn’t really find any western boots by them right now. When I’m wanting to wear jeans, I always tuck my skinny jeans into them. A flowy top like this one would be perfect for this combo, or you can add a long sleeve plaid if the weather is still cool. 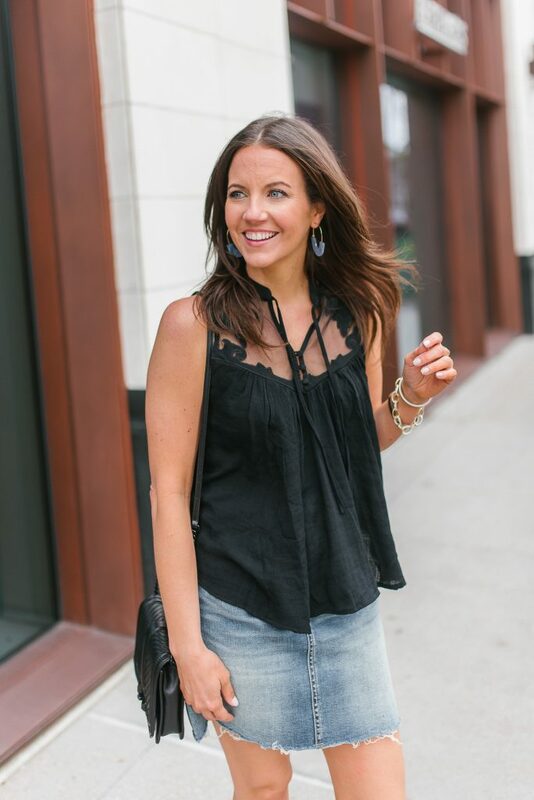 If you aren’t heading to a rodeo soon, this outfit with sandals will be perfect for you during the end of spring or summer months! I hope you guys have a fabulous weekend! I have a nice 3 day weekend headed my way, and I cannot wait! Check back Monday because I’m going to put together a list of Presidents’ Day Sales for you. It’s a good time to buy both end of winter clearance and stock up on spring basics. Be sure to come by and check it out! Where are all my Texas readers at? This one’s for you! Well really this outfit would be cute for everyone, but it would also be perfect for Texas rodeo season! BBQ cookoffs, carnivals, fried food, bull riding, horses, concerts, and my fave, a wine garden all come together to create our Houston Rodeo. The event also helps students earn scholarships through animal and art auctions, so fun for a cause. 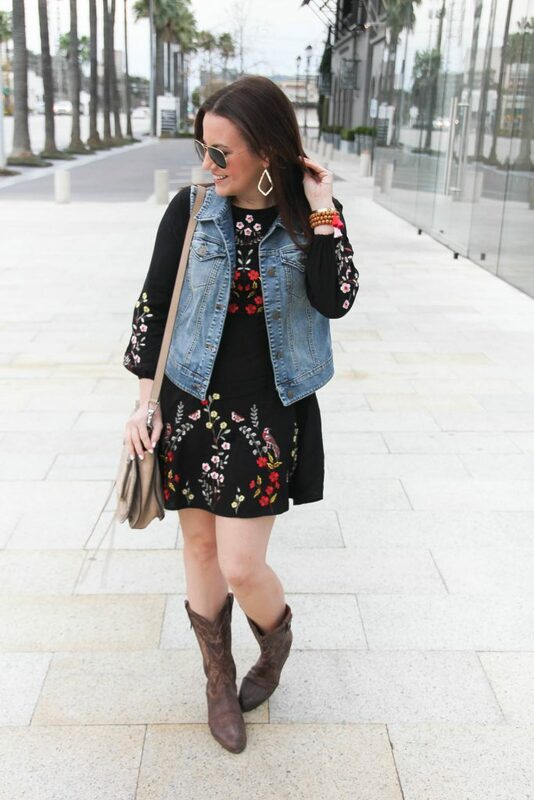 While I’m pretty sure it is a requirement to own a pair of cowboy boots if you live in the great state of Texas, I wanted to share a rodeo outfit without cowboy boots for those of you who haven’t found the perfect pair quite yet. FYI – Many online western sites have sales on boots for Texas residents during the month of February! 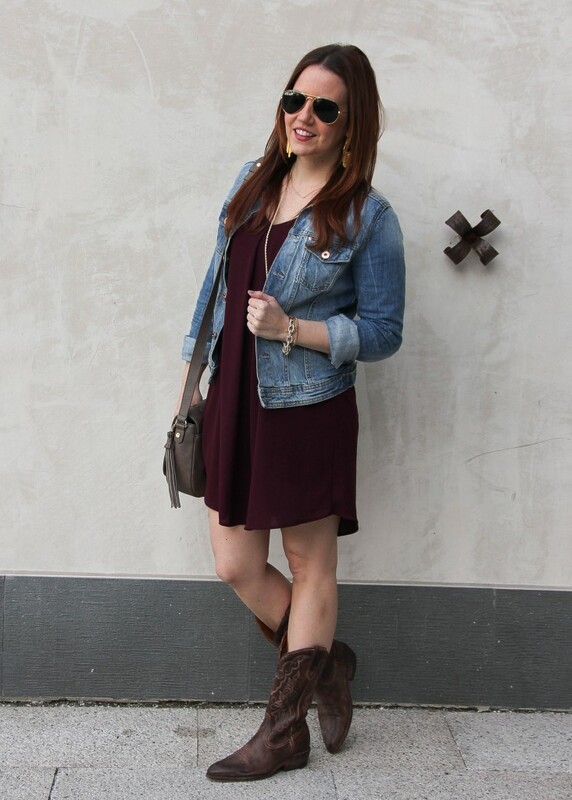 An easy fix to those missing cowboy boots is to grab a cute pair of brown booties. Bonus points if they have a little western flair to them. Make sure they are comfy to walk in, as you will easily hit your 10K steps at the rodeo! 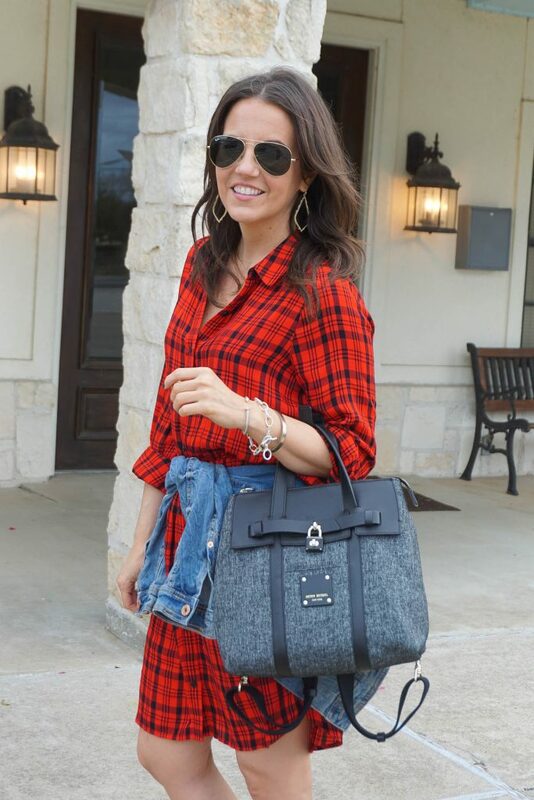 I love this red plaid dress for a full day of all the rodeo activities. It’s lightweight, and I think the red plaid is perfect for the rodeo. Since rodeo season takes place February through March, I usually tie a denim jacket around my waist to wear in the evening when the temps cool off. 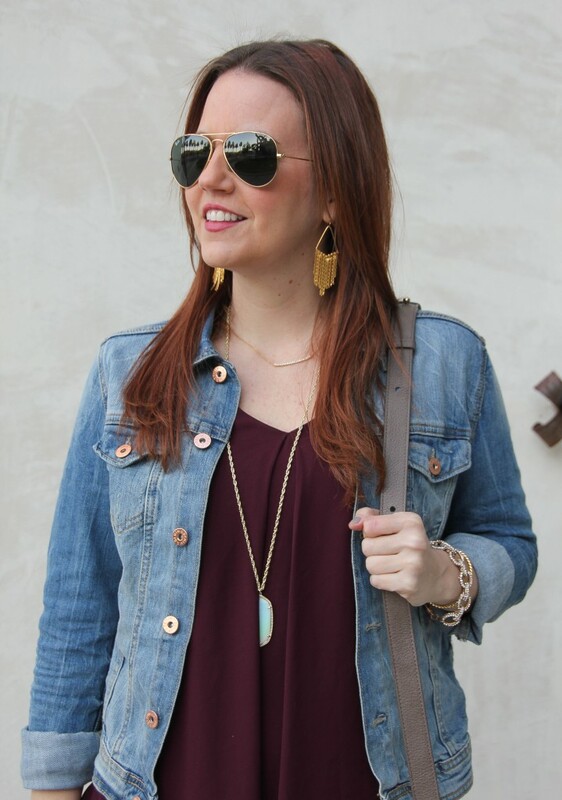 I also always opt for a crossbody or backpack style bag. I need my hands free for some wine and sausage on a stick. If you have plans to be in Houston Feb 25-Mar 17, you should look into spending a little time at our rodeo. It’s really is a fun experience and always a good time! We are just two weeks away from the Houston Rodeo you guys!! If you have never heard of it, think yummy bbq and fried foods, horses, bull riding, carnival rides, and big name concerts, plus my favorite part – a fun little wine garden. It’s a huge event held every March in Houston and last about 3 weeks. 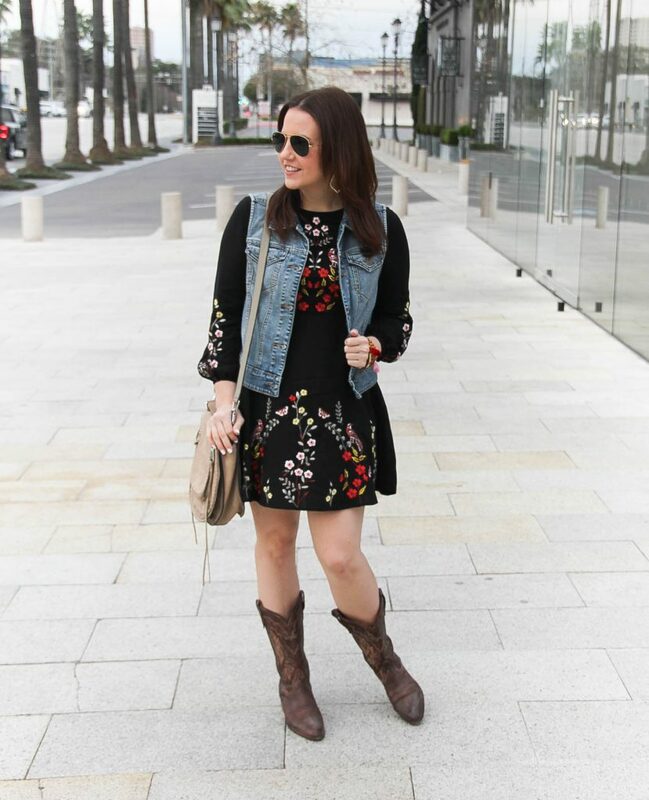 All the fun starts March 2nd, and today I am sharing what to wear to the Houston Rodeo. This outfit would work for really any rodeo or country music concert. Honestly, in Texas this could easily work as a brunch outfit too. I like my rodeo outfits to have small nods to western wear without being full blown. 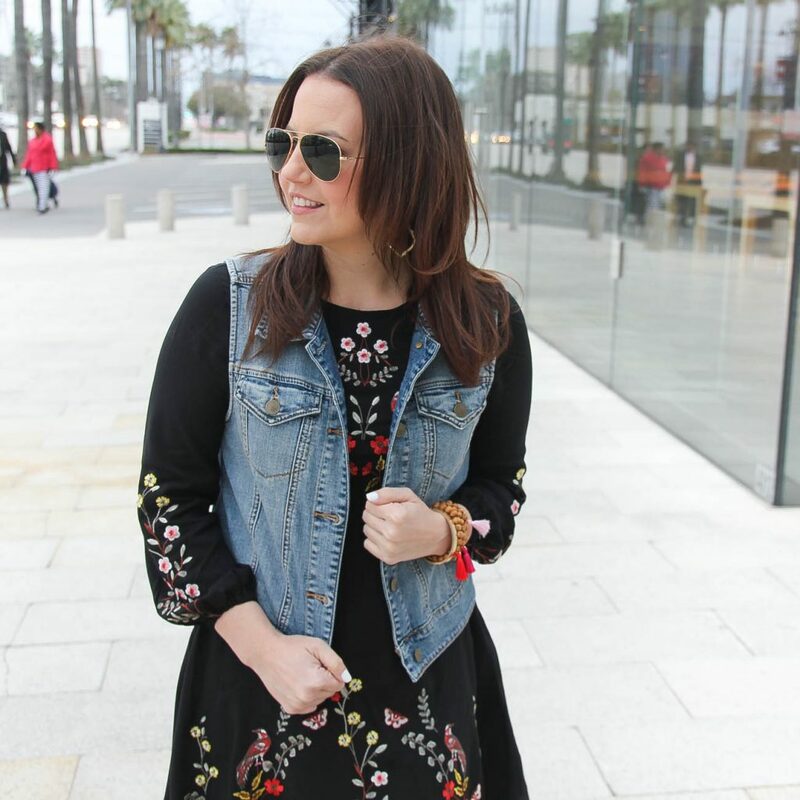 This year, I paired embroidered details with denim and suede. Our weather is a bit warmer this year, so I decided a dress would be a safe to wear. I adore the fit and flare look of this one. The embroidery is so gorgeous, and it’s also on the back of the bottom of the dress too. For a chillier evening you could pair this with a denim jacket, but for a beautiful warm day I would go with a denim vest. I love that it let’s the details on the sleeves be seen. 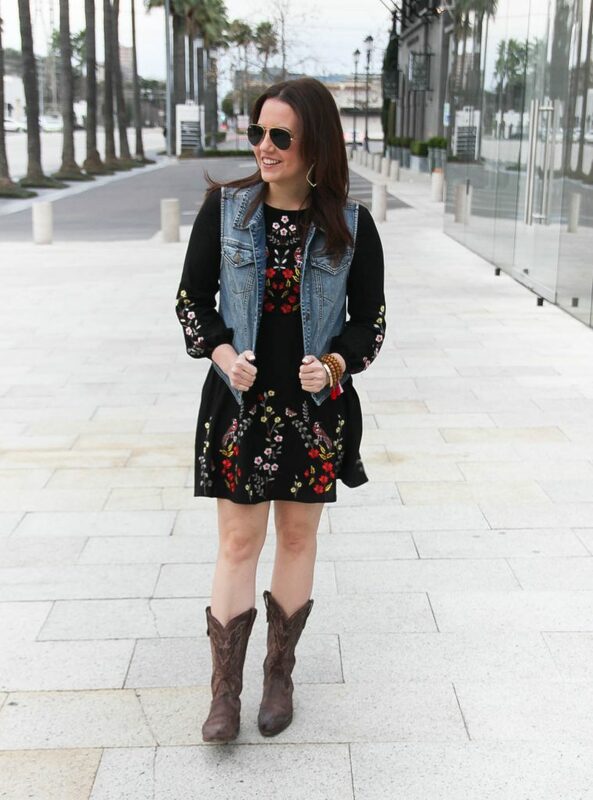 Of course, no rodeo outfit is complete without a pair of cowboy boots. If you don’t have a pair, booties or riding boots will work too. Keep in mind the event involves lots of walking and a little bit of dirt, so try to find something comfortable that can get a little dirty. If you are in Houston or planning a trip, you should definitely try to make a stop at the rodeo. There is lots to see, do, and eat. I highly recommend it! I’m suddenly craving a funnel cake and glass of wine. Ya’ll have good weekend, and thanks for swinging by today. 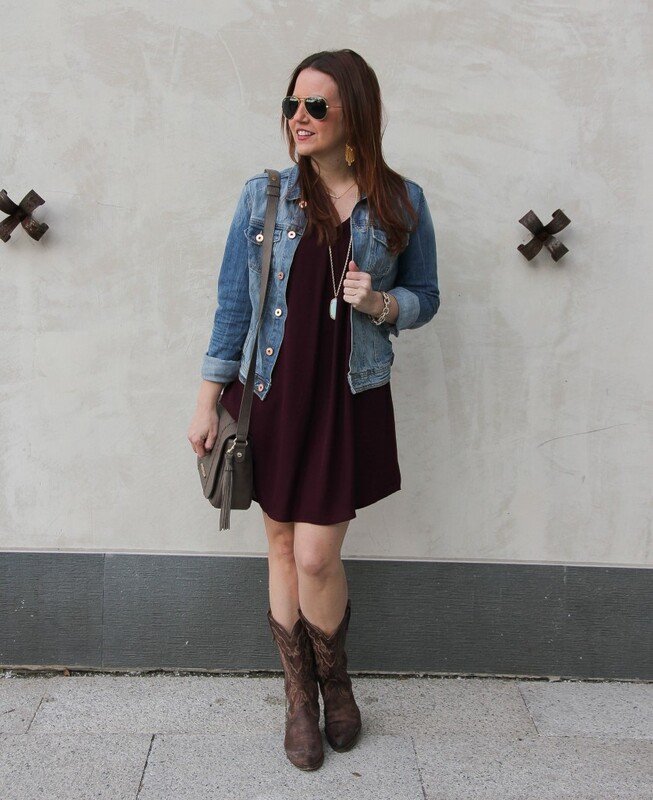 Okay, yes you have seen me post this dress a bunch over the past few months, but it is such a versatile dress!! 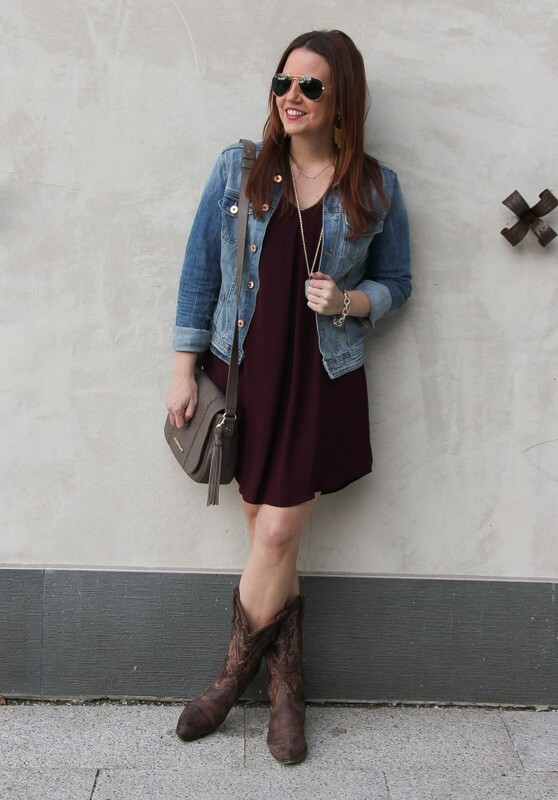 I have worn it to work, church, baby showers, blogger events, and it is also perfect for the rodeo! Since I have shared a day and evening rodeo look, I figured I would share a what I would wear to the Rodeo Cookoff outfit. Okay, so if you have never been to or heard of the rodeo cookoff, the general idea is a bunch of giant tents with people trying to prepare the best barbecue (brisket, sausage, beans, etc). Throughout the cookoff, judges pick the best dishes and crown cookoff winners. Of course, there is also live bands, djs, dancing and drinking involved. It’s a huge party! It is also one of the first rodeo events, kind of a pregame or preparty to the actual rodeo. I have mentioned before that you will leave smelling like smoked meat. It’s just part of the fun. 🙂 When picking an outfit, I look for items that are easy to wash or don’t absorb the smell. Both my dress and jacket are machine washable at home, so I can easily wash them a couple times myself. I find my leather boots don’t really hold the smoke smell, so any of my boots typically will work. You also do lots of walking and primarily all standing, so wear comfy shoes! I love my heels, but this is one night that I leave them at home. I find my cowboy boots to be really comfy, and a little spilled beer or dirt only makes them look more rustic. Most of the party/live music portion of cook-off happens at night, so you definitely want to incorporate a jacket into your outfit. I went with denim, because I think it makes the look feel a little more country. 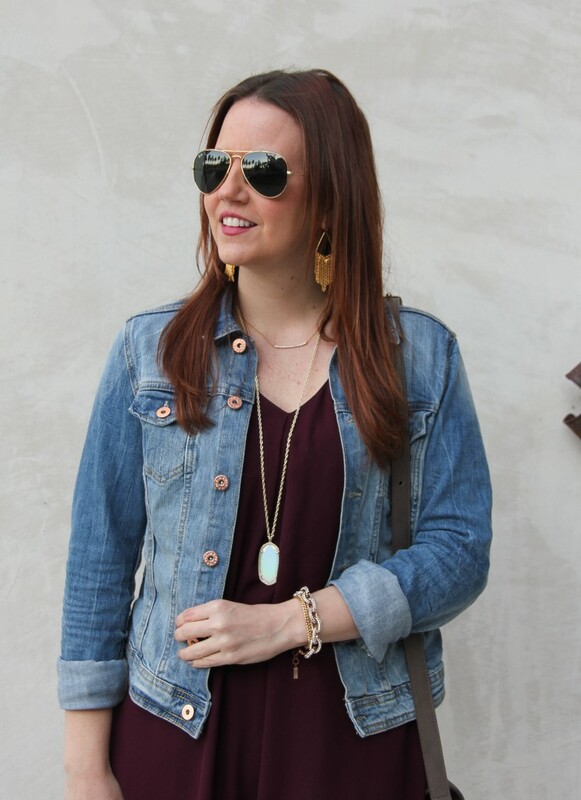 A denim jacket also give you the option to slightly roll up your sleeves if the weather is a little warmer. 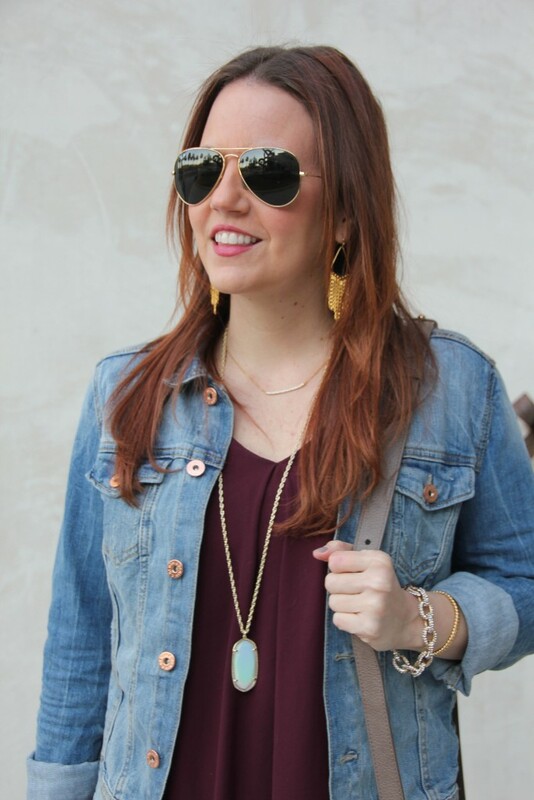 I added my fun party fringe earrings and long pendant necklace to add a little glam and sparkle to my look. My last outfit recommendation would be a cross-body bag! You will need your hands for plates of barbecue and drinks, so you don’t want to be holding a purse. Also, the event gets really crowded and a smaller purse makes maneuvering through crowds a little easier! 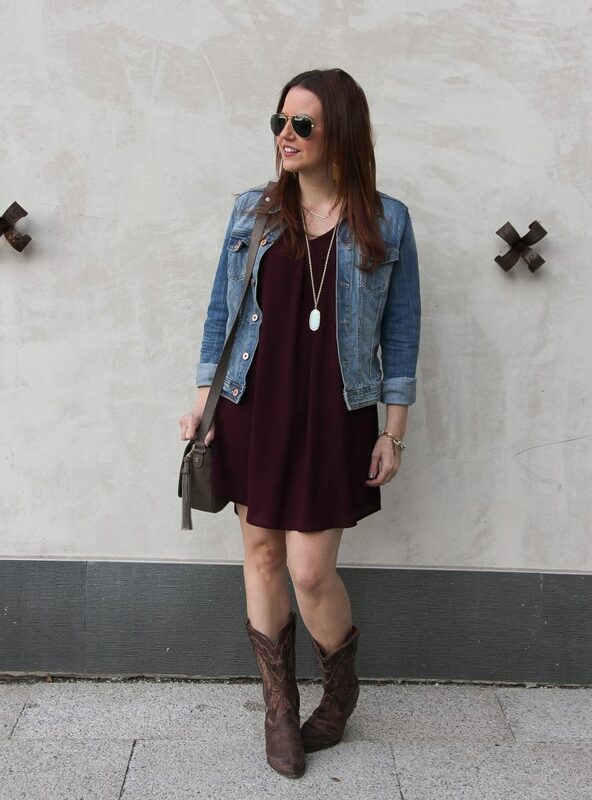 If you need more outfit inspiration for the rodeo, check out my posts here, here and here! If you are heading to the rodeo here in Houston, I’d love to hear what concerts you are heading too and what your favorite food, activity, or event at the rodeo is! Leave it in the comments below! 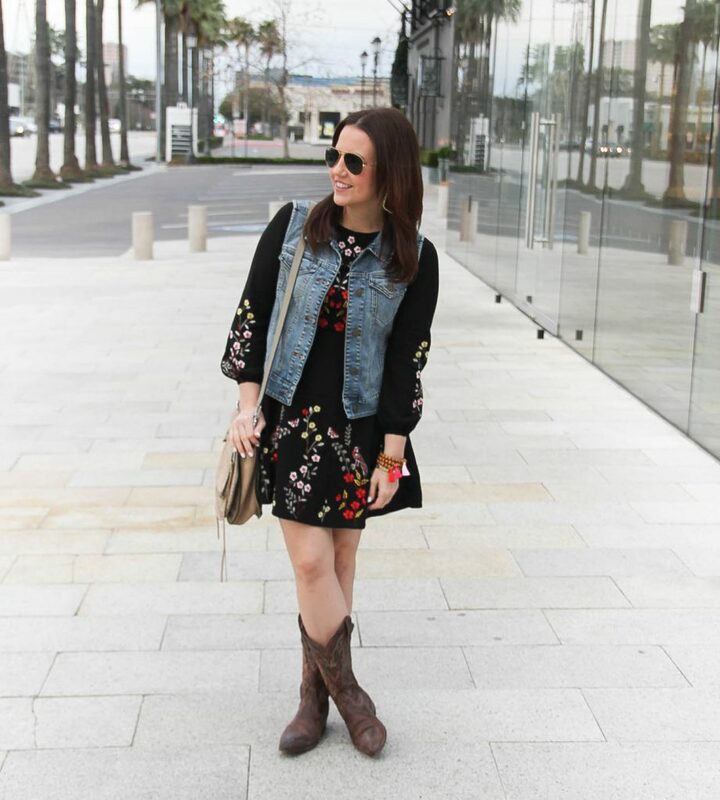 Scroll through for more Cowboy Boots!